We are a few weeks into the open enrollment season and TCP’s ALL IN For Health Campaign is working overtime to make sure schools and early learning centers have the materials they need to help uninsured children and families enroll or renew their enrollment in affordable health coverage. 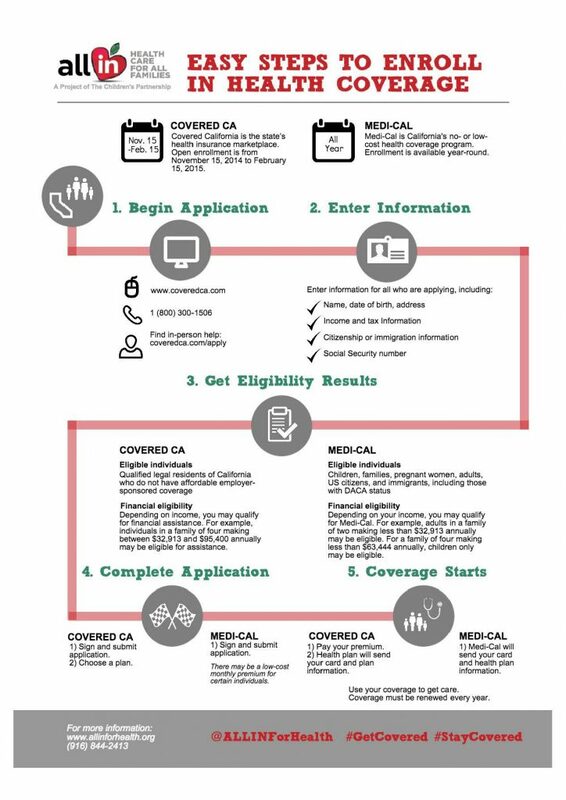 Open Enrollment for Covered California runs until February 15, 2015. This is an opportunity for individuals without health coverage to shop and sign up for health plans through Covered California. They may also be eligible for Medi-Cal, which families can enroll in all year long. Individuals can sign up for both programs at www.coveredca.com. We developed an infographic to help families enroll in just a few easy steps. We also worked with partners to develop English and Spanish family flyer, school flyer, and bookmark for schools to share with families. In addition to downloading these materials, you can order them here. Besides Open Enrollment for new coverage, it’s also time to renew Covered California health plans. In October, Covered California started notifying individuals who signed up for health coverage last year about the need to renew their health coverage. Those enrolled in Medi-Cal will renew their coverage on the anniversary of the month they enrolled. TCP’s ALL IN For Health Campaign works with partners—such as the California Department of Education, California School Boards Association, California School-Based Health Alliance, California Coverage and Health Initiatives, Covered California, The California Endowment’s Get Covered Campaign, and many others—to equip education leaders with the tools they need to educate families and individuals in the school, early learning, and after-school communities about health coverage opportunities and connect uninsured children, parents, and employees to health coverage. 6:35 pm - March 6, 2019.